The University of California San Diego was established in 1965 by contemporary composers Robert Erickson and Will Ogdon and offers studies in a wide range of music forms including classical, contemporary, jazz, Hindustani, computer and experimental. Auerbach Glasow provided architectural lighting design services for the Conrad Prebys Music Center’s performance spaces, public circulation areas and courtyard. 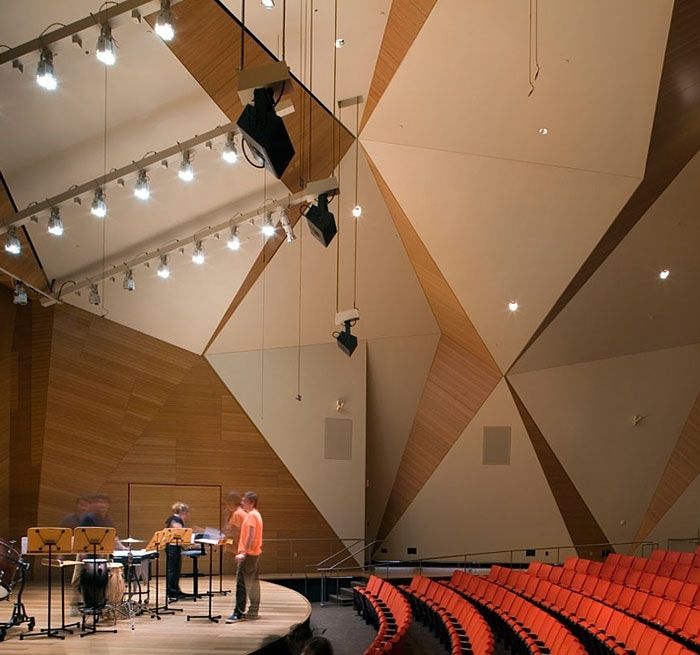 The unique walls and ceiling of the Concert Hall are comprised of triangular panels in an asymmetrical pattern. Lighting for this 400-seat hall, designed to reveal the volume and complex geometry of the space while providing functional light for the audience, is the result of close collaboration with the architect, acoustician and theatre consultant. 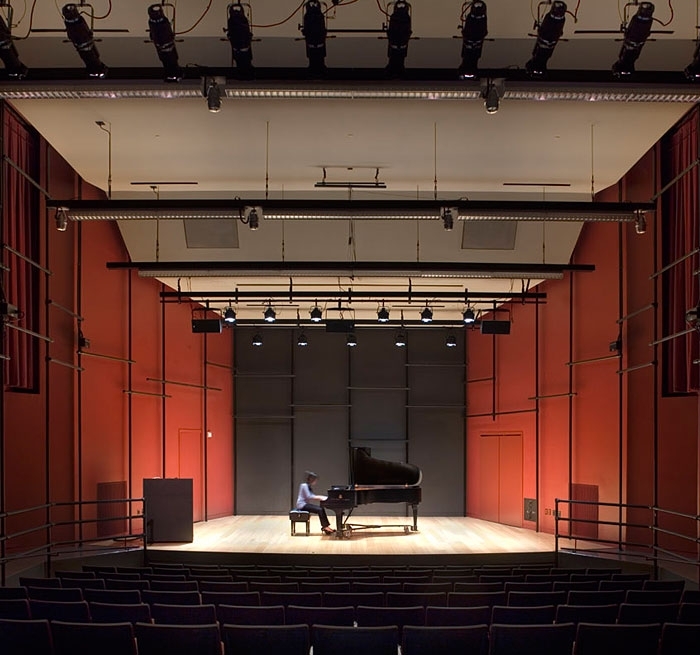 Hosting school lectures and small concerts, the 150-seat Recital Hall’s dual lighting system is comprised of fluorescent and halogen fixtures, providing the appropriate quality and quantity of light for these two very different functions. Fixtures, mounted side by side on a suspended continuous metal channel, create the appearance of one integrated system. The multi-use Experimental Theatre hosts performances, lectures and special events and utilizes three discreet lighting systems – energy efficient, high light level fluorescent for classroom and rehearsal use; halogen for audience lighting and theatrical lighting for performance. The rehearsal room’s lighting is broad and soft, providing an energy efficient, comfortable environment while delivering a high level of even illumination to approximate the light level on stage.